- Coming into the season, the expectations for Matt Barnes (pictured) were very high, but for most of this season the results didn't match. Even though the results haven’t always been there, however, the scouting report hasn’t changed and Barnes still has shown the same stuff that resulted in the lofty expectations and a third starter projection. During a recent outing in Portland, in less than ideal conditions, it was clear Barnes was working on a few things, specifically fastball command and his changeup. Barnes sat 92-95 with his fastball, topping out at 96 on occasion. He held his velocity into the fifth inning and missed bats with the pitch, eliciting five swing-and-misses and recording five of his eight strikeouts on the pitch. Three of the strikeouts were looking, and for the most part he commanded his fastball throughout the zone, relying on it heavily for the first three innings. Only once did he really give up solid contact against the pitch, as he did a great job keeping it out of the middle of the plate and down in the zone. That one mistake pitch came at a bad time, however, as the resulting triple drove in the only run he allowed. Barnes got into trouble only twice during the evening, walking two in the second and walking one and giving up a triple (one of two hits on the evening) in the fifth. In the second, Barnes seemed to be overthrowing and was consistently missing glove-side as his front side seemed to be flying open and he lost his line to the plate. It was raining off and on throughout the evening, and in the fifth inning it seemed to finally impact Barnes, as he was clearly struggling with his footing, slipping multiple times when landing and leaving a fastball up and over the plate for one of the few times in the outing. In past looks, Barnes’s best secondary pitch has been his curveball, while his changeup lagged behind. Through the first three innings, Barnes only threw four secondary pitches and he seemed to be focusing on fastball command. Of those four, three were changeups and, in the fourth inning when he started integrating his off-speed pitches more, his changeup remained his primary out-pitch. Barnes threw his changeup 83-87 mph and it showed some swing-and-miss potential. At its best, the pitch showed fade, down and away from lefties, and it was deceptive, coming from the same arm slot and arm speed as his fastball. He got two swing-and-misses against the pitch, and he seemed comfortable throwing it to both righties and lefties. Currently I’d grade the pitch as fringe-average with average-to-slightly-better potential. Barnes threw his breaking ball sparingly, but it was very effective. He threw six during the game, four for strikes, and recorded two strikeouts, one swinging and one looking. It came in at 76-77 mph on all occasions except one where he seemed to lose his footing. He did a good job finishing the pitch, burying it down in the zone with deep 12-6 break. The pitch showed plus on this occasion and he was able to use it as a weapon, keeping hitters off-balance with two strikes. 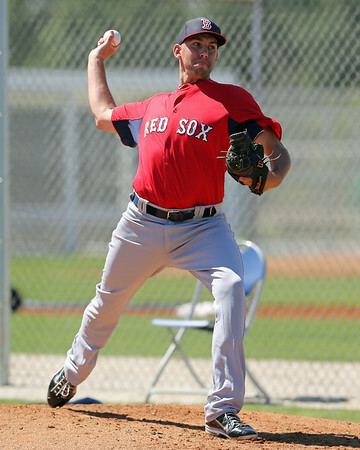 - Miguel Celestino relieved Barnes and showed a live arm in his inning of work. Celestino sat 94-97 mph with his fastball, but it lacked plane and his command was below-average. Hitters also get a really good look at the pitch as he shows it behind his body, then again early when he is driving towards the plate. His 86-88 mph slider was his best pitch in this outing, getting a swing-and-miss each of the three times he threw it. The pitch shows short, vertical break but lacks tilt. He also mixed in a high-80s changeup that looked like a fastball he took something off and lacks movement. At this point in his development, Celestino is more of a thrower than a pitcher. His raw stuff is impressive, but he lacks crispness and gets by because of his arm strength and the occasional wrinkle. - At the plate, there wasn’t much going on from the Sea Dogs as Harrisburg (WAS) starter A.J. Cole was very impressive. 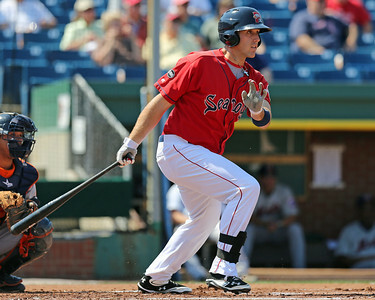 Portland’s only run came on a Travis Shaw (pictured) home run, which came after two tough at-bats. The first two at-bats resembled most of the at-bats I have seen from Shaw recently. Shaw’s average bat speed has been exposed this year and his approach has regressed; he is often getting caught out in front of off-speed pitches and behind velocity, especially on the inner half, as seen in these two at-bats. First, he weakly popped out to second base when he was caught on his front side against a changeup. Similarly, in his second at-bat, he struck out, swinging through a changeup. He was way out in front of the pitch with his bat lagging behind, on both strike two and strike three of this at-bat. In his final at-bat, however, Shaw did a good job working the count to 3-2 before getting a 94-mph fastball up and over the plate. This time he was right on it, clearing his hips and driving a hard line drive out to right field with a slight uppercut swing that generated good backspin. - Christian Vasquez’s defensive skill set has stood out each time I’ve seen Portland this year and it was no different on this occasion, as he threw out two more runners trying to steal second base. Vasquez has become a solid receiver with good footwork and a strong arm. His pop time on the first caught stealing was 1.87 seconds, much quicker than the average pop time of 2.0 seconds, but not his best time of the season. Vasquez also made an error on a pickoff that allowed a run to score in the 6th inning, which ended up being the difference in the game. Runners were on first and third with one out when he attempted the pickoff and the throw seemed to get away from him, tailing towards the infield. At the plate, Vasquez showed off a strong knowledge of the strike zone and the willingness to take a walk if the pitcher didn’t give him anything to hit. His bat speed doesn’t stand out, but it will play and he has a knack for making contact. At worst, Vasquez profiles as a backup catcher, but if he continues to improve at the plate he could potentially be more than that.